I’m not a competitive person by nature. In fact, I hate confrontations. I’m more of the “let me make you dinner and make up” type of person. While I think those people who always feel like they need to win or have the last word to be a bit of a self-righteous wacko, I envy them a little because they have the balls to stand up for what they think are theirs to claim. I know that my lack of competitiveness comes directly from my lack of self-confidence. Being competitive means that I would face a greater chance of failure, which could reinforce the little voice in my head that says, “I’m not good enough.” Being competitive also means that I truly need to trust in myself and believe that I am capable of achieving greatness … and I don’t think I’m there yet. I ran a half marathon over the weekend with my sister and her running friends. 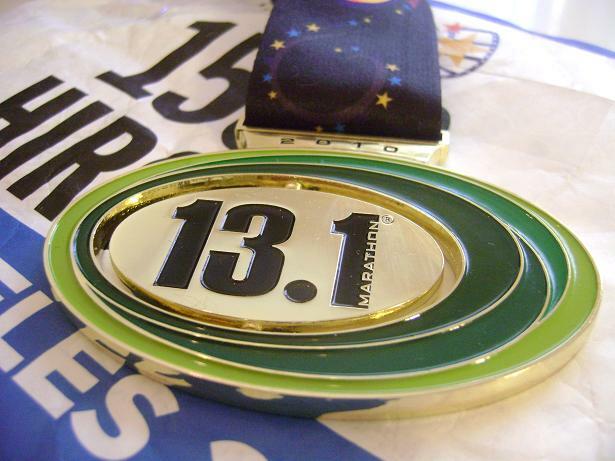 It was Inaugural 13.1 Los Angeles Half Marathon that took runners through the streets of Santa Monica, Venice, and Culver City, under the sunny Southern California sun (one of those moments that I truly am thankful for living in Los Angeles). Although it was an inaugural event, I was impressed at how organized the race was with plenty of water and Gaderate stations, and most importantly, plenty of porta-potties! Oh, and check out the finisher’s medal — it’s a serious bling and one of the best-looking medals I’ve received in races! This was my sister’s first half marathon and she finished the race at 2:01 (two hours and one minute). My sister, always the ultra competitive one, was kicking herself after the race because she missed her goal by mere seconds (her goal was to cross the finish line in less than two hours). Mind you, this is an amazing time, like, really, really fast! (Just to put it in perspective, I ran my race in two hours and 54 minutes and I thought I was going pretty darn fast!) Watching my sister stress over few seconds, a part of me thought, “Is she crazy? I can only dream of running that fast,” but later realized that this is what being competitive is all about. Competitiveness is not about being self-righteousness or wacky; rather it’s about believing in yourself, and constantly striving for improvement. Watching my sister, I knew that she would use this experience as the stepping stone to reach for her goal of a sub-2 race in the future. And I know she will get there. She really sparked a fire in me yesterday! She is truly inspiring. Motivated by my sister, I’ve decided that my new running goal is to give myself a little more credit and believe in her that she is capable of taking me to the next level. I truly love and thank my body for taking me on the 13.1-mile journey yesterday and staying with me every step of the way. I had a wonderful three hours with you and I can’t wait for our next outing! I will make sure to push you a little bit more (because I know you like that!) even if my little mind tries to tell me otherwise … because I know I am capable for going further! Thank you for finding my blog and leaving me a comment. OMG, I LOVE YOUR BLOG! I am so motivated by your journey to great health (and doing it the right way)! Your side-by-side picture of your old and current selves are amazing. Congratulations! And great job on completing the San Jose 1/2 Marathon! I am running the LA Marathon next week and I’m getting really excited. It’s a new route this year, starting from the Dodgers Stadium to Santa Monica! I look at running races as “walking tours” … LOL. SF must be a beautiful to run! P.S. You Hummus in bell pepper idea — GENIUS! Love this. I’m not competitive either and I never thought about the confidence aspect of it. Thanks for visiting my blog! I had the chance to check out your blog — I LOVE IT! I’m always looking for wonderful and motivating running blogs and yours is exactly what I was looking for. I’m glad that we share the love (and sometimes not so much … LOL) for running. I noticed that your first marathon was San Diego Rock and Roll … that was my first marathon as well back in 2005. I ran while raising money for Train to End Stroke. It’s great that you ran with The Team in Training!